As a business owner, we know that bad reviews are tough to deal with. That glaring one-star review on Yelp, Google, or Facebook can harm your online reputation and may turn potential customers away. While the goal is to always provide great customer service, at some point most businesses will experience a negative online review. How you respond to that negative review makes all the difference in how your customers will react to the review, and responding to negative reviews is an opportunity to show that you value your customers and are always looking to improve. We’ve put together a list of our top 4 tips for responding to negative reviews online, and have provided some examples of appropriate responses below. Negative reviews can feel like a personal attack sometimes, but it’s important not to be defensive in your response. Remember, your response may be read by hundreds of other existing or prospective customers. You should thank the customer for their feedback, address their specific concern, and offer a remedy when possible. It’s best to keep your response brief and sincere no matter how long the customer’s review is. Lengthy responses may seem defensive or disingenuous. Finish your response by inviting the customers to call or email you if they would like to discuss the issue further or if you have a remedy to offer the customers such as a refund. Did you know that you can get a negative review removed if it violates the review site’s policies? Click here for details on how to flag a review that violates Google’s review policies. 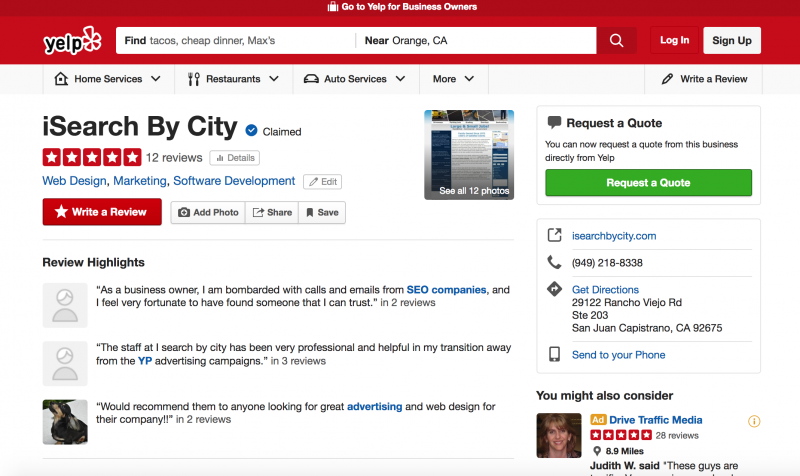 We’ve had success helping several clients remove negative reviews from Yelp and Google. ​I’m sorry to learn that this was your experience with us. We serve [hundreds/thousands] of clients every year and do our best to give each and every customer excellent service. If there is something that we can do to resolve your issue, please call me directly at [PHONE NUMBER]. I’d be happy to speak with you over the phone to see what I can do to help. I’m surprised to hear that this was your experience with us. We serve [hundreds/thousands] of clients every year and do our best to give each and every customer excellent service. In this instance, from what I recall, [EXPLANATION OF WHAT HAPPENED FROM OWNER’S PERSPECTIVE]. If you’d like to discuss this further, please call me directly at [PHONE NUMBER]. I’m always interested in helping our customers find a solution that works for them. I’m sorry that we were booked up. Typically we’re not booked out so far in advance, but it does happen from time to time because we get a lot of referral business due to the high quality of our work. If we can still be of service to you, please give me a call. iSearch By City provides the best value in custom, content-rich websites and digital marketing. We offer comprehensive review management software and coaching to help companies build their portfolio of positive reviews and maintain a strong reputation online. To learn more about how you can improve your online presence, visit our website or give us a call at (800) 499-2064.